Using maps, ignoring maps, gassing up in Bethlehem where I’d been based (gas is definitely cheaper in Palestine than in Israel, more than half, or so I rudely calculate), knowing the terrain well enough that I can simply drive north from my hotel straight thru the whitewashed checkpoint (literally whitewashed), and find—after a great deal of traffic and perhaps some miscalculated map directions, that’s the harrowing part, stuck in traffic, missing turns, backtracking, passing two accident sites: this is how many Jerusalemites live 5 days per week, making the self-reported stress level because of traffic higher than that from security issues, yes, truly, so a recent poll among Israelis found—the site of Deir Yassin, now the Kfar Shaul Mental Health Center. The center was first built from converted Arab housing, allowed to deteriorate, then, after an outcry (not about the massacre there but about the conditions and treatment), renovated again. 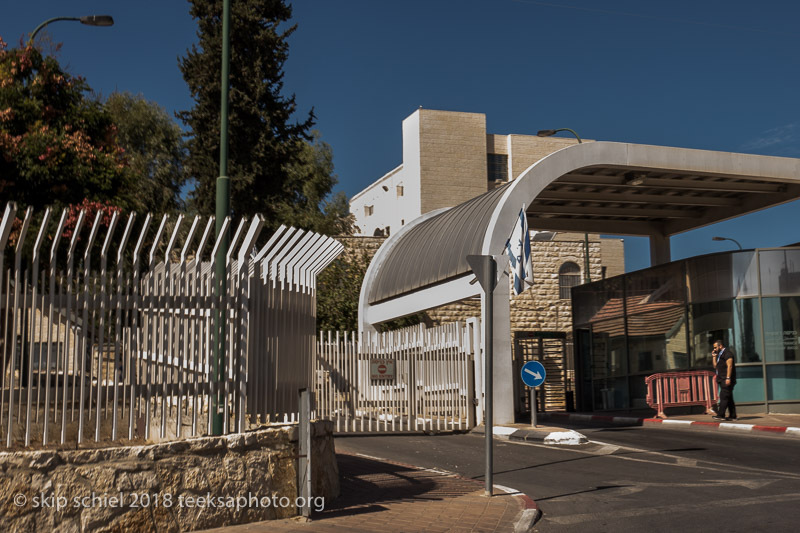 Oh, if only I could enter (not as a patient, but if needed—it once treated people for the Jerusalem syndrome, people believing they were the reincarnated Jesus)—a patient, with cameras ablazing. But I managed. I first went behind the large complex, thinking I’d be less noticed, and photographed the fence and thru the fence. Several Orthodox Jewish schools sit behind the site; kids sounded joyful. What, dear teacher, do you teach about the complex and its history? I noticed men carting what looked like construction debris out of one building, possibly further renovation, possibly carrying remnants of the history. I was careful to not be spotted. Mostly I show backs of buildings, not ideal. But for any glimpse, no matter how cursory, I am indeed grateful. Then the front, thru the fence again, and as I drove off, one hand on the wheel, the other operating the camera, swiftly to not be noticed, stopped and forced to delete images, I made a small set of seriously overexposed views of the gated entrance. I’d not realized how high Deir (Deir in Arabic means monastery) Yassin (a surname) had been, a hilltop, with views in all directions. Spectacular. How much can current internees, patients, see from this hilltop? How aware are they and the staff of the site’s history. How much do neighbors know? What are they willing to admit? 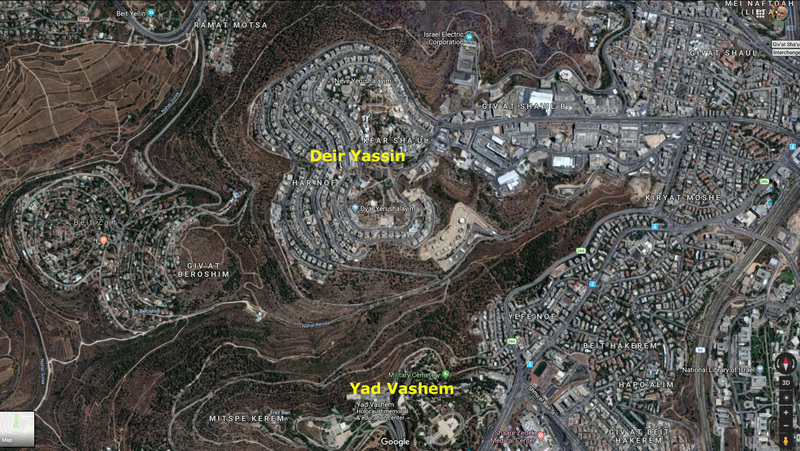 What about former residents of Deir Yassin? Have they returned? Has anyone organized a pilgrimage? My visit felt like a private pilgrimage, to be shared with others thru my photography and writing, if anything useful emerges. A fine culmination for my two-month tour of photographic duty. Earlier while near the site of another destroyed Arab village, Beit Nattif, having just discovered the utility of GPS coordinates (I found recent posted photos of the site, cisterns, etc, and used them to locate the village site), Ayed, my friend and confidant from Aida refugee camp, phoned to ask how I was, where I was and what I was doing. I told him about my new idea to add another dimension to the expulsion stories: how had the expelled people traveled from their villages to eventually reach a refuge? That maybe we could work together, he for pay, for us to re-interview people about this new dimension. He was excited. He offered that he thought maybe many had collected together and walked to Hebron. Then to their refuges, possibly using motorized or animal-propelled transport. I’d like to research this. 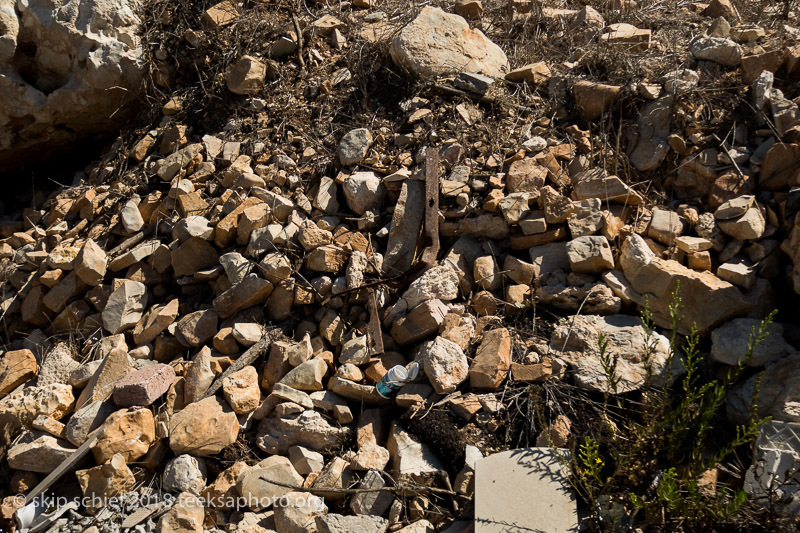 During another phone call with Ayed while I was exploring destroyed villages, across the impenetrable by him Green Line separating the West Bank from 1948 Israel, he’d reminded me how desperately he wished to join me in my return to Palestinian homelands. Unfortunately, despite his family’s original home being in what is now considered Israel, across the Green Line, he is unable to join me. We must never ignore the injustices that make charity necessary, or the inequalities that make it possible. Since returning home in mid October 2018 I have steadily selected, processed, and posted photos, movies, and writing from my two months in Palestine-Israel—and now I’m about to return. 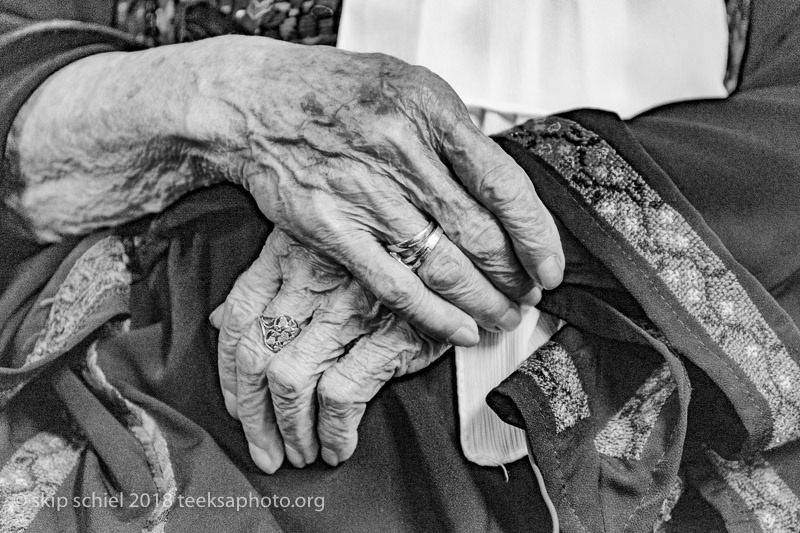 During that two-month autumnal period—one of the most beautiful seasons in the region—I interviewed and photographed twelve Palestinians, mostly first generation refugees (expelled during the Nakba in 1947-48, the Palestinian Catastrophe coincident with the foundation of the Israeli state); four were second and third generation refugees. I also located all the destroyed villages they’d lived in, eight of them, an arduous process because of deliberate disappearance and replacement by Israeli communities and parks, and because of their new names, the process of Judaization. I plan to return to the region from mid May to mid July 2019 to continue my project. 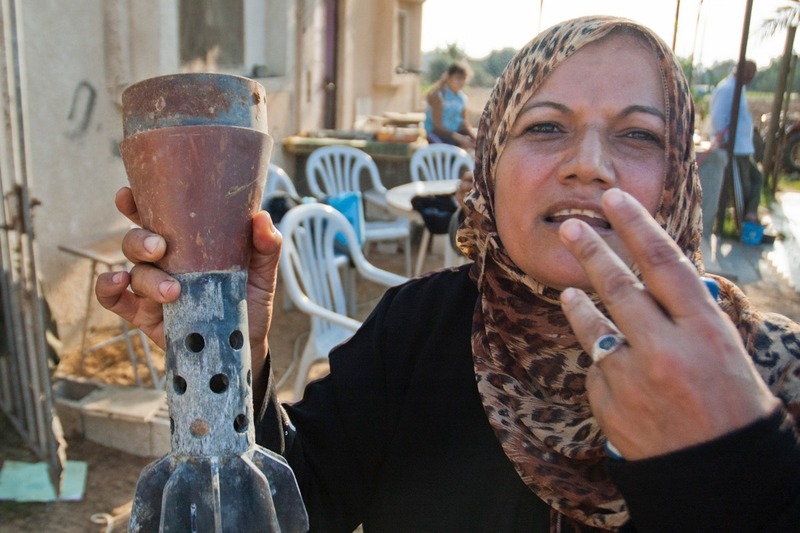 Simultaneously I’ve been commissioned to document the work of the Alternatives to Violence Project (AVP), especially in Gaza if our entry application to Israel is accepted, also in the West Bank and Israel. AVP teaches—with local partners—non-violent resolution of conflict. This continues the documentation I began last fall in Hebron, Ramallah, and Bethlehem. I’ve consulted closely with a Palestinian raised in the Aida refugee camp, a Palestine-American academic and anthropologist, and an Jewish American-Israeli who is working on a parallel project. All three live near me in the Boston area. I’ve applied for an internship with BADIL, the Resource Center for Palestinian Residency and Refugee Rights, hoping to mutually fertilize our work. I will again consult with Zochrot, an Israeli NGO that advocates for the Palestinian right of return. I hope to also coordinate with B’Tselem, the Israeli Center for Human Rights in the Occupied Territories, and Adalah, The Legal Center for Arab Minority Right in Israel. As far as I know I am the first to attempt a photographic project about this theme. The issues erupting from Palestine-Israel have troubled me for decades, as they have the world community. Mainstream media tends to justify Israel’s positions. Currently and alarmingly the United States’ president and Israel’s prime minister are particularly close, heading largely right-wing governments. Inflaming the conflict, our president has recognized Jerusalem as the capital of Israel, and sanctioned Israel’s occupation of the Golan Heights. He has also cut all funding for UNRWA, the UN Refugee Works Administration responsible for refugees services. 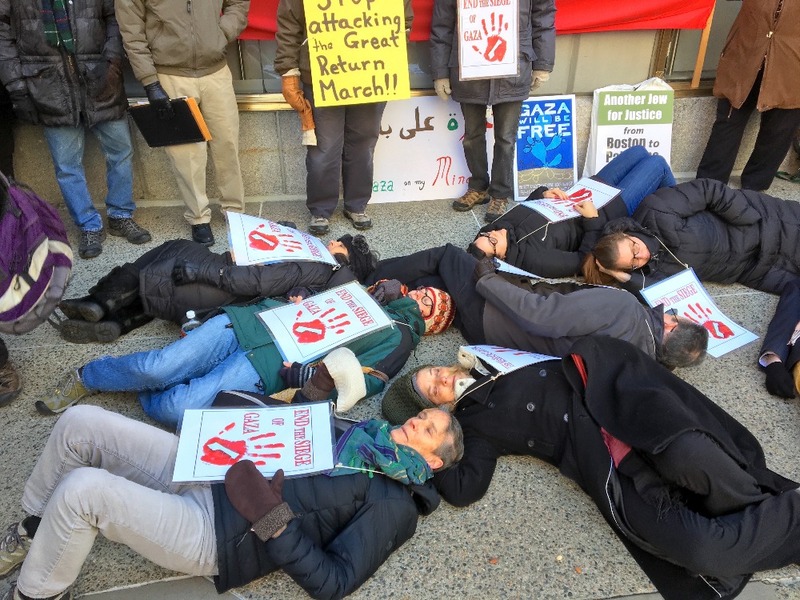 Many think this is a prelude to ending the right of return for Palestinian refugees. Most of the international community rejects these decisions. Policies of my administration and much of the congress are counterproductive to fostering justice, peace, and security for the region. Since 2003 I’ve visited the region to witness and interpret conditions, making many friends and colleagues among both Palestinians and Israelis. And I’ve photographed Palestinian refugees in camps in Gaza and the West Bank, but their diaspora extends worldwide, forming the largest and longest-lasting case of displaced persons in the world today. Many times in the entire region, many photos, writing, and movies later, I now attempt to broaden the constricted picture many North Americans have of the overall Palestine-Israel situation. Major questions: what happened during the expulsions? What were their lives before the Nakba? How did people travel to sites of refugee, what could they bring with them, have they ever returned to visit? How do people forced from their homelands presently live compared with Israelis in those former Palestinian homelands? How are the stories transmitted thru the generations? Do they wish to return, under what conditions? 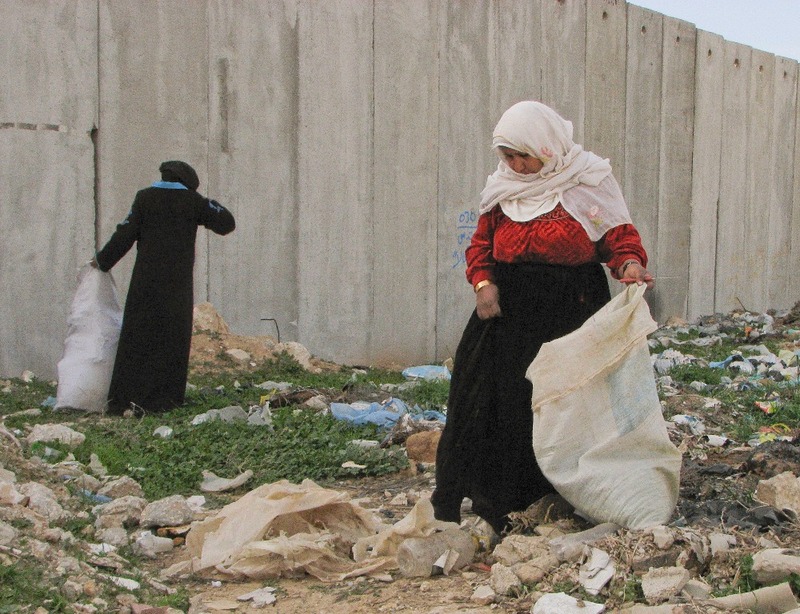 And generally how might a right of return for Palestinians work? I hope to contribute my small effort to resolving the conflict, fostering justice, security, equality, and freedom for all human beings in that troubled region. I’ve been a photographer, filmmaker, and writer for most of my adult life. Struggles for justice and peace in different parts of the world have been my main concentration. While in South Africa in 1990 and then again 8 years later during one of several of my international pilgrimages, I began to understand the parallels between conflicts in South Africa and Palestine-Israel. Apartheid, an Afrikaner word meaning separation—which I interpret it as Separation with Hate—operates in various forms in both regions. In Auschwitz in 1995 I learned more directly about the holocaust, which helped propel the creation of the Israeli state. I was raised Catholic and imagined Jesus walking thru the dusty Holy Land with his disciplines. Thus grew my curiosity, leading to my concern about that region. And then finally in 2003, during the end of the Second Intifada (Palestinian Uprising), the year an Israeli soldier driving a Caterpillar D9 bulldozer crushed and killed Rachel Corrie as she protected a Palestinian home, I was on my way East. This began one of the most meaningful journeys of my life. I’ve photographed widely in Israel and Palestine, many different populations, many different activities: Israelis training as first responders, Palestinians living in tents, Israelis walking and shopping in Jerusalem and Haifa, Palestinians studying at various levels and ages, and Israeli middle school students investigating local archeology. I’ve explored all the areas of Israel, West Bank, and Gaza (except for the Sinai which is currently too dangerous to enter). 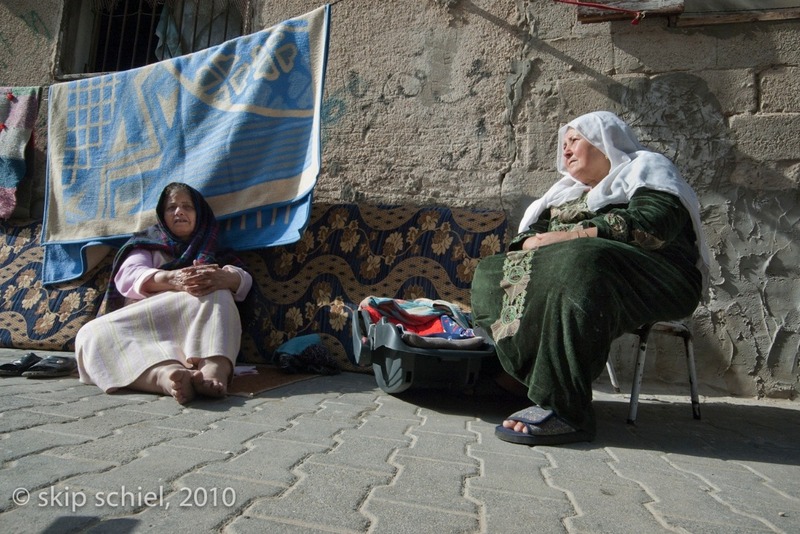 For this project I hone my focus: refugees inside Palestine-Israel. Please see my blog for more about my motivations for this project . Palestinians are one of the longest colonized populations— in 1948 and again in 1967 during the Six Day War by Israel, meaning the occupation of the West Bank and later the siege of Gaza—and still living in diaspora. I have shown the reality of the matrix of control, walls and fences, checkpoints, permits, home demolitions, restricted roads, inordinate fines, deportations, targeted assassinations, leveling of entire neighborhoods, violent repression of nonviolent demonstrations, etc. As well as survival mechanisms, the family, faith communities, organizations, political action, etc. Now I have the opportunity, thanks to contacts in Gaza and the West Bank, to show more widely the consequences of colonization and expulsion. In mid May 2019, I return. Assuming Israel grants me an entry permit, I will enter Gaza; if unable to enter Gaza I will concentrate on the West Bank, expecting to complete the project after several more trips by the middle of 2021. Despite the recurring turmoil in that region, I’ve always managed entry to Israel, the West Bank and periodically Gaza. I can’t guarantee entry this time, only that I will try my best. Despite the political uncertainties I intend to maintain focus on Palestinian refugees and internally displaced persons the West Bank, Gaza, and Israel. This is a multi-year project. As in the past, I will create exhibits, slideshows, blogs, movies, and ultimately a multi platform book (meaning full use of print and the internet). As with all my projects I will post photos and writings on my website and blog—dispatches from the field. By presenting powerful and contrasting images of life in the current and original sites of internally displaced Palestinian refugees, I hope to build awareness and inspire action. The end result: beyond coexistence to a breath-taking sharing of the region, its resources, histories, luminaries, and potential. A true Holy Land. * The plea of refugees in Gaza to return to their ancestral villages now in Israel is the central focus of the Great March to Return. It began on April 2, 2018, was planned to end on May 15, 2018, but as of this writing (April 1, 2019) is ongoing. These dates mark two important historical events, Land Day when 6 Palestinians were killed as they attempted to return to their villages in 1976, and Nakba Day marking the beginning of The Catastrophe, or the Grand Dispossession in 1948. Between March 30, 2018 and March 22, 2019 Israeli army snipers have killed nearly 271 Palestinians, mostly unarmed, with approximately 29,187 wounded, including 25% wounded by live ammunition, many with life-threatening injuries often caused by exploding bullets. Nearly 5,000 of the injuries and 41 of the fatalities were children. This overwhelms the already stressed medical system. 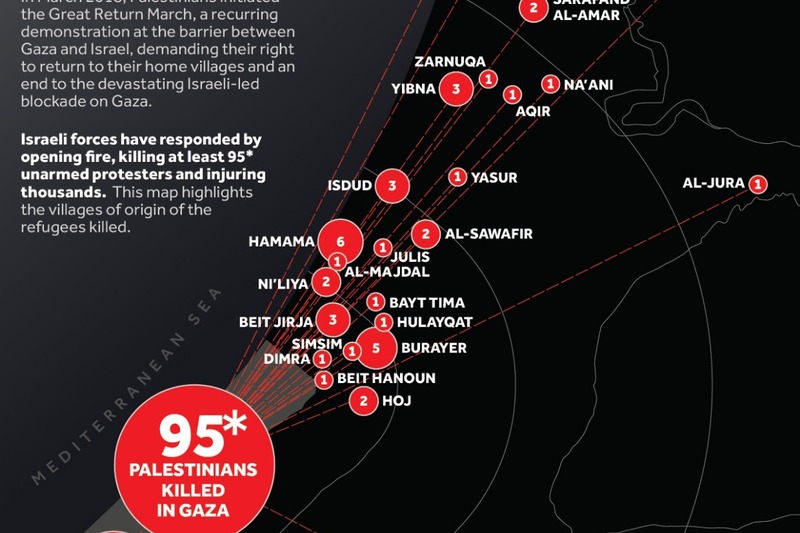 Compared with 2 Israeli deaths and 56 injuries. (UN Office for Coordination of Humanitarian Affairs) Because of the ongoing violence we may need to postpone entering Gaza until violence abates. In that case I will be mostly in the West Bank and Israel. …Many of the injured suffered extensive bone and tissue damage from gunshot wounds, requiring very complex surgeries. Between 30 March 2018 and 28 February 2019, 120 amputations took place as the result of injuries sustained during demonstrations, including 21 children, with 22 people paralyzed due to spinal cord injuries and nine people suffering permanent sight loss. The Health Cluster estimated that by the end of 2018, over 1,200 patients with limb injuries would require complex and timely limb reconstructive surgery; these are highly complex injuries that, if not treated, may heighten the risk of secondary amputations. These challenges come on top of existing, systemic challenges to Gaza’s health sector in the context of more than eleven years of blockade. Since 2006-7, there has been a reduction in human resources for health, per head of the population; long-term shortages and depletion of essential medicines and medical supplies; and electricity shortages and power fluctuations causing dependence on emergency fuel for generators and resulting in damage and the reduced lifespan of sensitive hospital equipment. 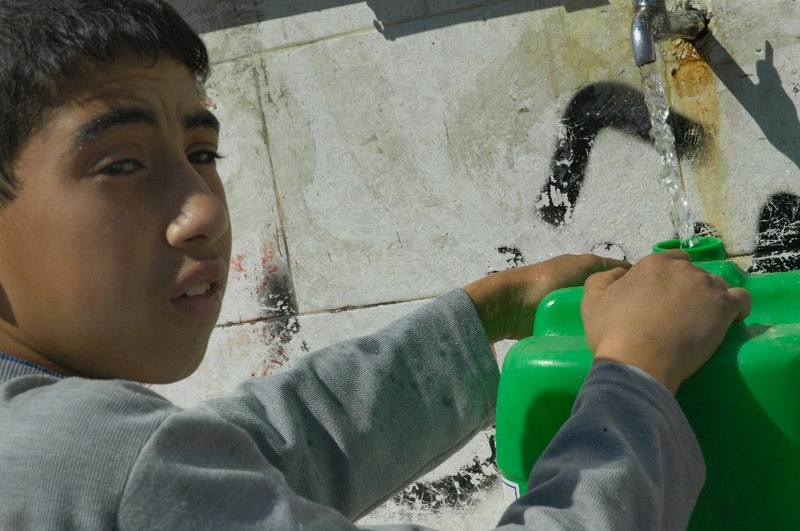 Since mid-2017, in the context of the intra-Palestinian divide between the Ramallah and Gaza authorities, medicines and other medical supplies, salaries for medical staff, funds for auxiliary medical services such as sterilization at hospitals, delays in countersigning of referrals, and fuel for energy that supports critical health facilities have been reduced, which has hampered the ability of the health system in Gaza to adequately respond to needs…. Movie (same title as book, Eyewitness Gaza)-link on the thumbnail immediately below. Skip Schiel has been documenting the Palestinian and Israeli reality through photographs and journal postings since 2003. 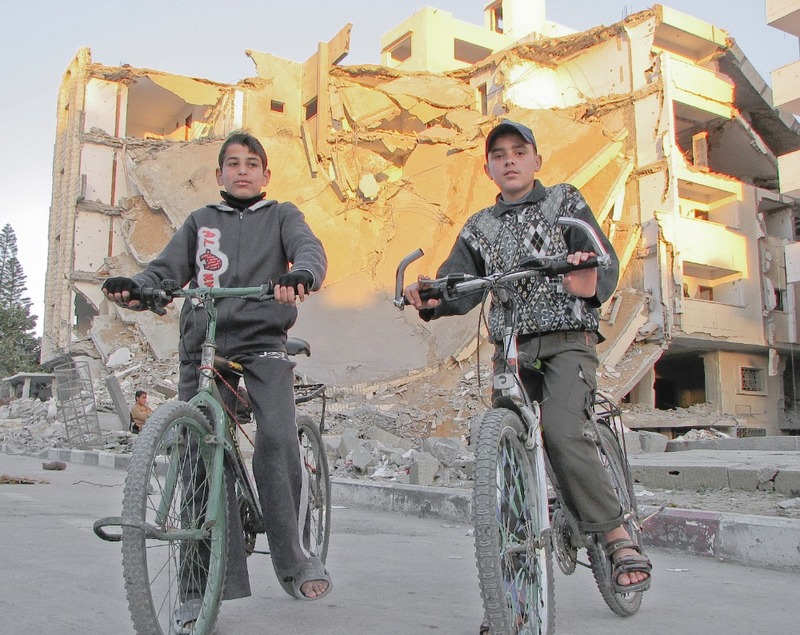 They contribute a better feel for the detailed texture of life in Gaza and the West Bank than any appearing in US media. Schiel spends time where most journalists dare not tread, amidst ordinary Palestinians, sharing in the dangers and frustrations of their lives. Skip Schiel photographs not only with his eyes but with his heart. It saddens me to hear of the difficulties Skip is going through [finding an audience]. This is discouraging for us who are struggling in the situation. I never would have suspected that his pictures were not balanced. The first act of nonviolent resistance is to tell the truth. His pictures shared that. Let’s pray our dear friend does not give up! Skip’s creative ministry has challenged, informed and inspired our [Quaker] Meeting for many years. His work is a visual reminder to us of the importance of remaining faithful to our peace and social justice testimonies. 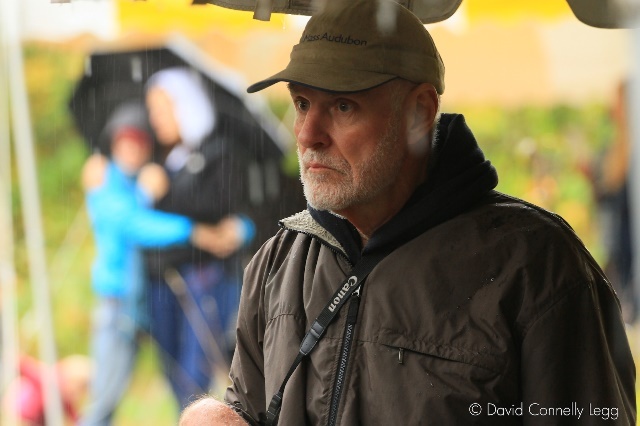 You capture such powerful, symbolic moments in your work, that reach beyond the context they are in. I admire your brave tenacity and commitment to documentation of this struggle for justice. Your sensitivity to light and emotion is dramatic, the brilliant daylight framing the sad courageous eyes and brave determined expressions of our Gaza neighbors, as they face such a cruel, demented, and terrifying adversary. I think you are very brave too, and I thank you deeply for shining a true light on [the situation]. We [the Haganah, precursor to the official Israeli military, IDF] adopt the system of aggressive defence; during the assault we must respond with a decisive blow: the destruction of the [Arab] place or the expulsion of the residents along with the seizure of the place. Yesterday [October 14, 2018] I found or believe I found Al Qabu, the village of Nidal Al-Azraq’s family. I’d first first explored the nearby Israeli village/moshav/kibbutz, Mevo Beitar. And also Ilar/Alar/Ellar (alternate English spellings of Arabic names), the village of Ahmad Ali Dawoud’s (who I’d interviewed and photographed). Plus the Israeli site, Bar Giora. I need to consult my photos with the GPS coordinates to pinpoint reliably were I was, except maybe in the case of Qabu. Because of alternate transliterated spellings, Hebrewized names, lack of experience with Arabic and Hebrew names generally, and the intentional erasure of Arab villages, this is one of the most complicated photographic projects of my life. Qabu presented a special challenge: where exactly was or is the site? As often happens (me searching for Rachel Corrie’s death site in Gaza for instance), various people had various ideas. A woman in a gas station, the station rumored to be near the site, confirmed that yes, this is the site. 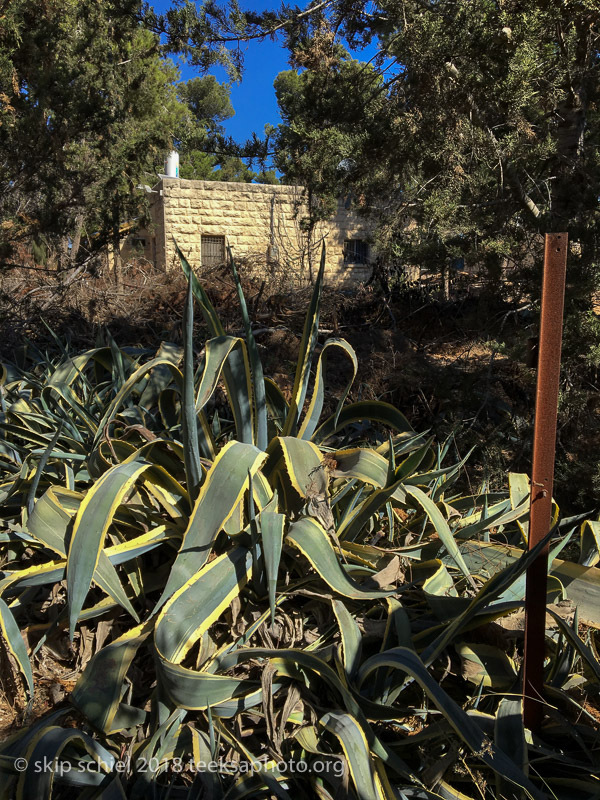 So I surveyed from a distance an open field, gently sloping, with curious concrete platforms and possible stone markings—and occasional clumps of prickly pear cactus, otherwise known as sabra (which is also the name of first generation Israelis). Driving thru an open gate, thinking, yes, Qabu, let’s find the Crusader church reported to still exist in Qabu—over rough roads, oh valiant friends—I ended up at a cemetery. Cars were parked outside, a woman told me it was not the church but a Jewish cemetery, and thus I concluded, this is not Qabu. Out comes my laptop; up comes the info I’d collected; no help. Then I remembered Nidal’s description: immediately right after the checkpoint. Going which way? I emailed him, no answer. I guessed: coming from the West Bank. So I went thru the checkpoint on the 48 Armistice Line, headed into the West Bank, noticed as I passed (not sure I’d be stopped, questioned, what I’d claim), a forest area on my left, which would be on the right coming into Israel. Now in the West Bank I turned around, slowed down after the checkpoint (no interrogation, the guards looked bored, as guards often do, devoting eons of their lives to just waiting for something to happen, trying to remain awake and vigilant), videoed the fence which I thought would prohibit me from entrance, considered hopping the fence, decided against it, and then saw a sign to “Begin Park.” Once in the park I learned it commemorated the former Prime Minister and possible war criminal, Menachem Begin. How ironic, if this is Qabu. Exploring, I found a shrine and several other Arab indicators, a stonewall, a pool possibly for collecting water or bathing. Because the day waned, the light faded, I decided not to search further for the church. My mission is not to find historic sites, but to establish contact with ancestral sites and make some good photos. Earlier, maybe at Mevo Beitar or Bar Giora (they merge in memory), I’d sought overnight housing. A young pregnant woman I asked turned her infant over to her grandmother (life goes on), walked me to a home she thought might offer housing. The woman in the house phoned someone, her sister-in-law I think she said, and put me on the phone. 550 shekels/$150. Beyond my budget, I answered. What is your budget, thinking, calculating—200 shekels/$50. Sorry no deal, she said. I drove on. Life is tough on the Israeli road when not in the cities. Hello my friend skip. I hope that things are going well with you. I couldn’t be with you Saturday even though I am dying to visit beit jibreen and other villages. Lucky you, my friend. I am so thrilled, honored and happy about meeting you and knowing you. I wish all the best. Hello dear friend, ayed. I too am sad we couldn’t be together THIS TIME, maybe later. I explored ajjur today, now sit in the new moshav of agur, wondering where to go next. 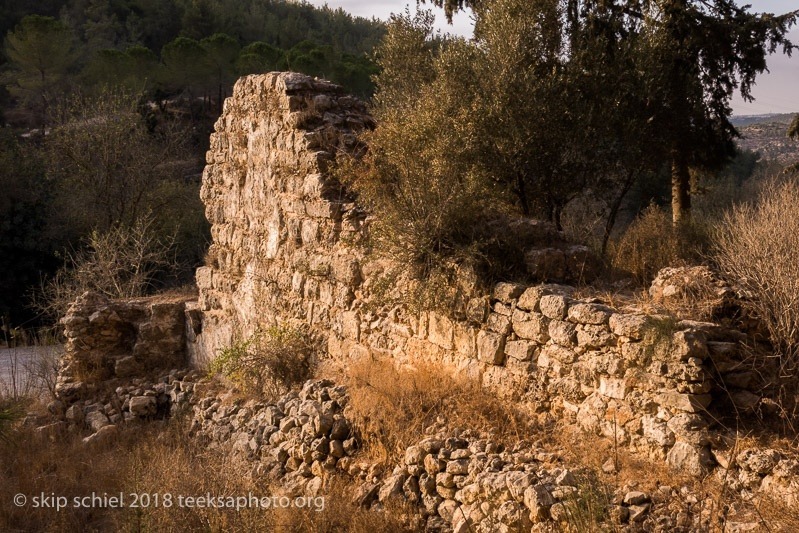 Maybe beit jibreen. Earlier, before I’d located Qabu, in what is probably another destroyed Arab village, now called Britanya, at the first picnic site, I sat along the road beside my car eating my lunch. Gradually joyful sounds came closer to me until they came from directly behind me. I turned around and discovered a children playing in a large tree, the same family I’d spotted earlier at a picnic table and surreptitiously photographed. A boy about 14 years old asked me what I was doing (the only inquiry so far, and not with suspicion or rancor). I answered photographing beautiful nature (a half-truth, or one-quarter truth. Consulting with some of the adults he recommended about five sites including the Dead Sea. Later the two families set off on a hike into the valley. I learned that this trail system is art of a cross-nation trail. I’ve seen lots of bikers and signs warning of cyclists. A physically healthy and happy nation, or so it seems. I pondered asking the boy, say, do you know anything about the history of this park, did anyone live here long ago? My excursion provokes several thoughts. What was life on the road for the refugees of 1948 and 1967, in the Qabu to Bethlehem case, a climb and descent of 200 meters or 650 feet, and a distance of 14.3 km or nearly 10 miles? Carrying the little luggage and valuables they could carry, possibly carrying the elderly. Unsure if they’d ever return to their homes. Where to go for refuge? How to establish a new home? Where’s the justice in all this? Would they survive? Living in a tent, in a camp, in the winter. With many other families. All we want is to be ordinary, said Darwich. Another thought: homeless in the USA, the richest country in the world, perhaps, and in history, perhaps. Yet people live on the streets, Chip for instance, thru the year, in the winter, Chip apparently sufficiently provisioned even if minimally so. Another: displacement because of gentrification. The folks who consulted with me about 11 Sacramento St, Cambridge Massachusetts, my new neighbors, and now have moved in, may have displaced Nicole and Ronen. Where do Nicole and Ronen go, why was they displaced? Or Stan, my buddy Stan, who by now may be out of his apartment, maybe in Arlington elderly housing with much less space? I wrote him a few days ago, hope to hear at least moderately good news from him. I may write his daughters. Or me, potentially, forced out because of gentrification. Or earlier as a 14-year-old boy—not forced displacement for my parents—but for me moving from Chicago’s South Side, away from friends I’d grown up with for 10 years, this was an abrupt and painful displacement. Amongst ourselves it must be clear that there is no room for both peoples in this country. After the Arabs are transferred, the country will be wide open for us; with the Arabs staying the country will remain narrow and restricted … There is no room for compromise on this point … land purchasing … will not bring about the state … The only way is to transfer the Arabs from here to neighbouring countries, all of them, except perhaps Bethlehem, Nazareth, and Old Jerusalem. Not a single village or a single tribe must be left. And the transfer must be done through their absorption in Iraq and Syria and even in Transjordan. For that goal, money will be found – even a lot of money. And only then will the country be able to absorb millions of Jews … there is no other solution. I’ve done a fair amount of research about locations and routes. 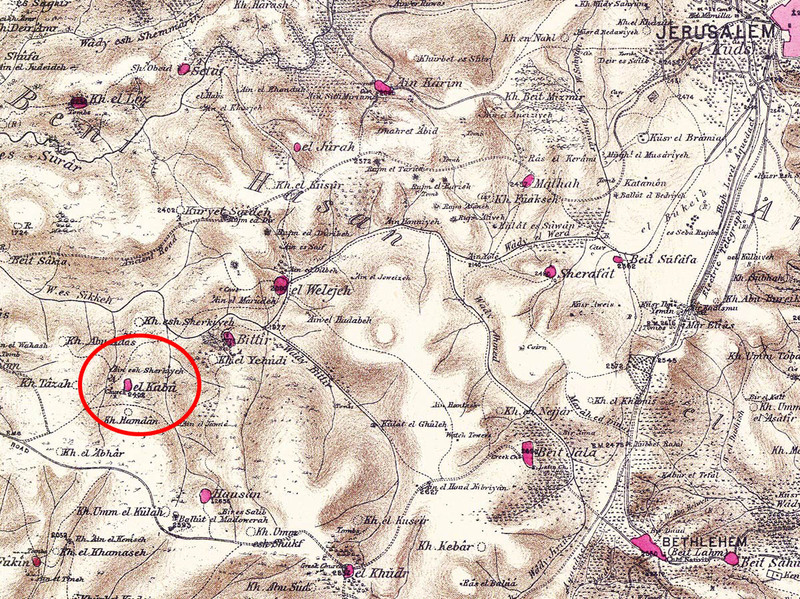 Nidal helped last night when I belatedly realized I’d not included his family’s origin site, Al Qabu (spelled Gabu in my notes), near Tsar Hadassah, which is near Wadi Fukin on the West Bank side of the Green Line. Most of these destroyed arab villages are near each other, which makes sense because all the folks I recently interviewed live in Aida refugee camp, proximate to the origin sites. To a large extent I expect to rely on Google Maps on my iPhone, rather than the paper maps and guidebook I brought. So much for paper, lightens the load. And perhaps directions I ask but I will need to exercise care in what I ask for, not the Arabic name, but the newly crafted Hebrewized Israeli name. 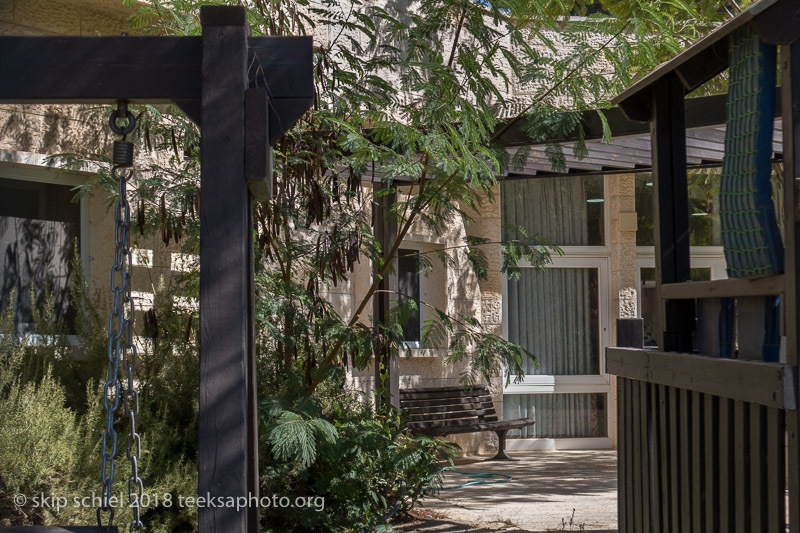 I look forward to discoveries, disappointments, good food, overnights in moshav guesthouses (no hostels that I discovered reviewing my literature last evening), and even in my car, if I can rock the seat back and sleep comfortably. I plan to go light, leave most of my luggage at the Golden Gate hostel, and hope I decide correctly what to bring. Thinking I’m at a crossing point in this project, thus a good time to send a dispatch as I’d promised to my financial benefactors, yesterday I wrote a string of people, virtually the same message each time, personally adjusted to each person. Starting with Paul D, my first donor, followed by Shola, my second, and ending with my last so far, Diane M. They qualified by donating $25 or more. I was heartened by the list, by the image of each person, as if I carry them with me, and they carry me. I don’t recall ever doing this sort of fundraising before, where the mechanism creates a digital trail that I can readily access. Unlike earlier when I sent a physical asking letter, deposited checks, kept a record, left it at home when I traveled here, thanked only once upon receiving the money. thanking you again for your support and for being a neighborhood inspiration. from the old city of jerusalem after one week in the aida refugee camp in bethlehem, now during a day off: finished with photographing (for now) internally displaced palestinian refugees in the west bank (blocked from entering gaza, maybe next spring), finished with photographing and videoing trainings of the alternatives to violence project (avp) in 3 west bank cities, now about to drive to some of the villages the people i met were expelled from in 1948 and 1967.
samples below at the links. onward. and later, when home in six days, i begin the next phase of this multi-trip journey: post production. as a wise person once stated, falling out of an airplane is the easy part of the trip, the hard part is when the trip ends. While eating a delicious chicken dinner with salad and bread that I’d picked up at the local family restaurant about 200 meters to the south of the GG hostel, and reading the latest bulletin from Friends Meeting at Cambridge (FMC), my phone rang. Minga! She dropped in via Whatsapp, asked what I was doing, heard my news, asked about my (Alternatives to Violence Project (AVP) experience, who I’d met, given her cards to, and told me about recent FMC news, the Quaker birthday timeline that Chris J put together for the family meeting (which included me), and her uncertainty about going to the Texas border, El Paso for accompaniment, or to El Salvador for AVP. She then put JVB (her husband and my good friend, Jonathan) on who asked that we switch to video. I showed him around the hostel, introduced him to Lutfe, the hostel manager, who they both knew from previous stays here, and asked that we have a conversation, the 3 of us, shortly after I return, “to talk all about me,” I said. Meaning a decompression period, a digestion period, a time of reflection. I reminded him that he and Minga are the only Quakers who share so many details of Palestine-Israel experiences. Including the Christian Peacemakers Teams, Hebron, Ramallah, Jean Zaru, Ramallah Friends School, Ramallah, and right on down to the GG hostel. Minga asked what I’d like her prayers for. Mostly in the realm of open heart, open eyes, good health, and relative safety, not too much safety, just enough. She asked me if I minded traveling alone. I answered no. Maybe now, in my current station in life, I might even prefer it. As the joke goes about the 102 yr old woman: anything good about being so old, yes, no peer pressure. Traveling alone means no wrangling with a partner about where, when, why, and how. I recall all the fights Louise and I experienced driving cross-country in 1990, and yet, despite our fights, that trip led to one of the highlights of my experience with her, the Bigfoot Memorial Ride to Wounded Knee. And the drive itself was monumental and unforgettable. Also traveling with the AVP team earlier on this journey was a delight and I miss them constantly. Leaving Bethlehem thru the checkpoint I’d thought earlier I might write Katy [one of my two daughters] another note with some more photos but didn’t really have the chance. I made a few surreptitious photos as I went thru the vast mechanism, turnstiles, waiting people, and workers rebuilding the checkpoint, probably all Palestinian, and might consider, if I have time, sending her one or two with a brief account. I might include several acts of gentle kindness I experienced during this brief trip. As I stood outside my Aida guest quarters waiting for Mousa to drive me to the checkpoint, a man pulled up before the house, picked some people up, and then asked me if he could help. I told him I was waiting for Mousa. He phoned Mousa who told him he, Mousa, was waiting for me to phone him that I was ready. I didn’t know this requirement. Without that surprise benefactor I might have been waiting much longer: where the heck is Mousa? Mousa himself of course who’d offered to drive me when I’d asked about taxis. Waiting outside the checkpoint for the big bus to Jerusalem, a long line of older folks presumably going to Al Aqsa mosque for Friday prayers, I wondered how to signal the driver to open the luggage compartment and not lose my place in line, risking he’d drive off without me and with my luggage? After I’d loaded my luggage from the outside a man told me to enter the bus ahead of others, but in effect regaining my place in line. On the crowded bus, standing room only, me with my heavy bulky backpack and second small pack, a man who looked at least as old as me wearing a sort of turban, motioned for me to take his seat for the relatively short ride to Jerusalem. No thanks, I motioned back, pointing to my pack. Too much trouble but thanks anyway. Maybe because it was Muslim prayer day or simply natural good heartedness and Arab hospitality, I was richly treated. Aida camp where I now happily reside seems not to have the same sort of draw as Jerusalem, the same richness of history. Altho Bethlehem is often the site of violence. Maybe it’s Rachel’s fault; her tomb is nearby. A goldmine here of another sort: participants in my refugee project. 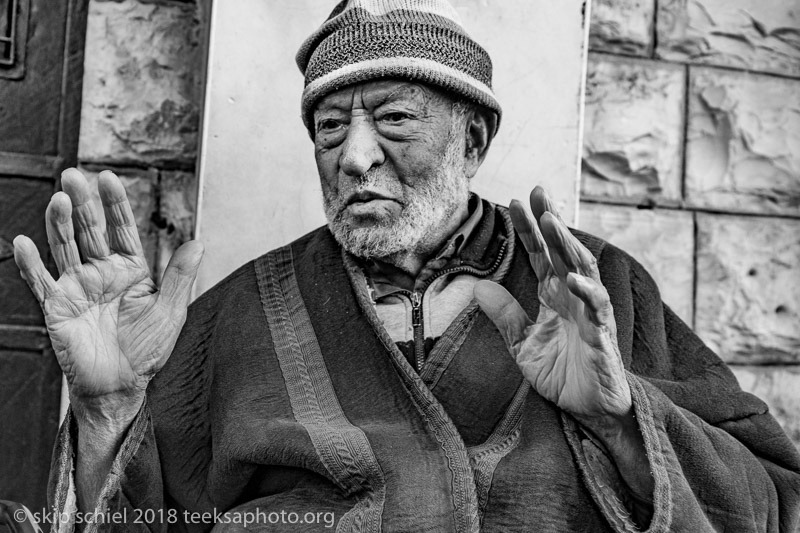 Yesterday, thanks to Abed and Murad, I photographed Abed and later an old man who Murad helped me with, the uncle of Abed, Abdel Majid Abusrour, the brother of Abed’s mother. Among the benefits of life in a refugee camp are the extended family and a compact neighborhood where most everyone knows everyone else over a long stretch of time. Kids play unattended in the streets, much like our earlier generation could play freely on the streets of our neighborhoods. 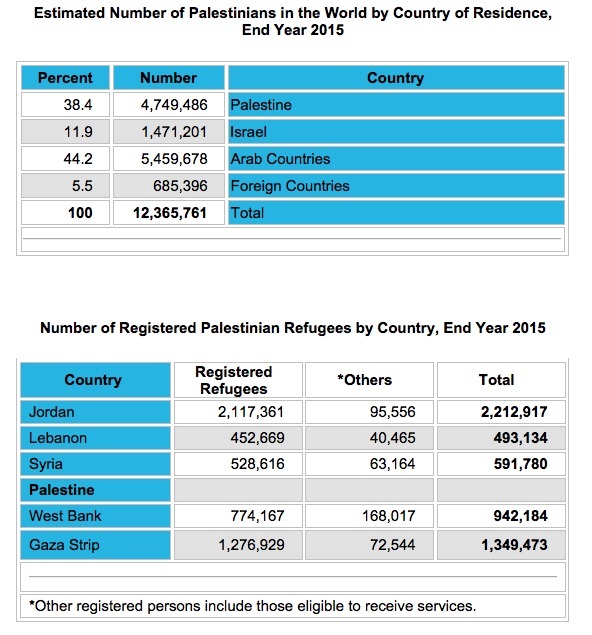 One might argue—Trump might argue—that UNRWA (UN Refugee Works Administration) is not needed to service these camps. 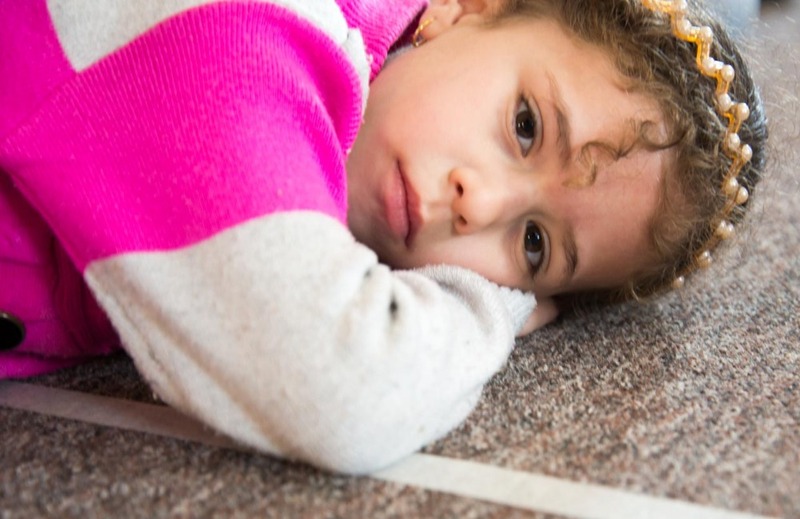 He and other critics might argue that not only do people take advantage of the refugee benefits like medical, housing, educational services, but they prefer to stay in the camp. Much the way some think homeless people prefer to be homeless, or poor people poor. And there might be some truth to that. But the suffering of all these groups eclipses their supposed benefits. It might be like arguing that people affected by a tsunami actually benefit because of the change in scenery. Once again I klutzed it with my interview with Abed. About 10 minutes in, after he’d brilliantly laid out his refugee history—mother and father born in different villages near here (including Beit Natiff which I plan to photograph later), parents married I believe before displacement, displaced, family first lived in a large tent with many families in Aida, then in a small, one room block house where Abed was raised—I noticed again that the recorder was in standby rather than record mode. (I vow to set the recorder to recorder mode before I set up, so even tho some memory space might be wasted, I will not have to remember to switch to record). I recorded the rest of his story: large family, some 12 offspring, many of whom died Abed thinks because of camp conditions, expanding the house, his wife from Silwan (near Jerusalem, across the valley from where I usually visit, the east side of the Kidron Valley, the side with the burials and death monuments), and into the present moment, his family split between Silwan and Bethlehem. 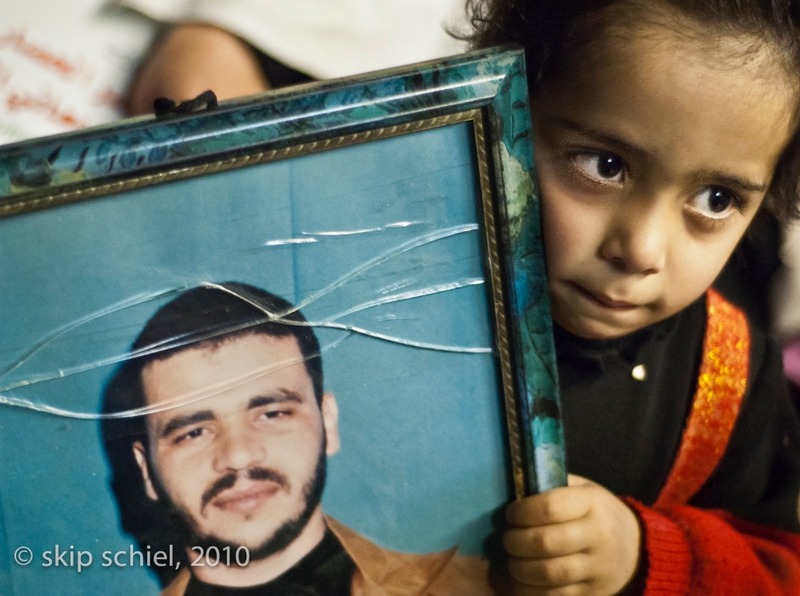 Abed believe Israel punishes him because of his activism, most notably giving the introductory speech during Pope Benedict XVI’s visit in 2009. I’d heard Abed tell parts of this story to various audiences but not the with this much detail. He’s not written it yet, altho he’d like to, even a book. He is a practiced speaker, cogent, lively, detailed where necessary, giving an overview when more appropriate, frequently smiling, and anticipating questions like what keeps you going? In large part, he said, community. His brothers contribute money and donated their shares of the family home, now the site of the Al Rowwad Vocational Training Center or what I call Rowwad-2. This new building and what it contains certainly marks a new phase for Al Rowwad, maybe also for the camp and for Palestinian refugee camps generally. Another fellow, the deputy director of Rowwad, a fast talking young man with a heavy accent which made understanding him difficult toured me thru Rowwad-2. Its lower floor incorporates a cave with two tunnels that formerly people used to flee the Israeli army. High tech equipment includes a computer-assisted 3-D printer, something that burns designs into wood or plastic, huge woodworking machines, etc. And on the two top floors quarters for volunteers that resemble fancy hotels. And restaurant facilities. The three-part strategy is to train, provide employment for local people, and offer services. My guide told me that the rooms could rent to others besides volunteers—a hotel in a refugee camp. My guide reminds me of several other adamant, true believers. When I asked him if he or Rowwad would work with Israeli partners who actively opposed the occupation, he said unequivocally not—the normalization syndrome. He’s similar to the Palestinian-Canadian man I’d met at the hostel in Old City Jerusalem who spoke so assuredly about the folly of evolution and the truth that we all descend from Adam and Eve—and that Allah-God exists, “as surely as you and I exist.” For my guide, the truth of his oppression generates his fervent belief in the rightness of his struggle. One might ask, is Al Rowwad’s new expansion wise? Is it a good investment? Earlier Abed admitted that he’d embarked on the project, expanding the family home into Rowwad-2, during a more favorable fiscal climate when money seemed guaranteed. That climate has disappeared, even before Trump, and now he can’t afford to pay salaries. Abed’s folly? Or Abed’s monumental vision? Today, being Friday, Aida is unusually quiet. No one nearby, empty streets, I’m not sure about the Lejee Center, the other cultural and educational center in the camp (pronounced la-ghee with the emphasis on la, not la-ghay, which would be French). I meet Murad at Rowwad at 1:30 to photograph more people. And I might work this morning at Lajee—if open— for the fast internet and company, but I so love working alone at home, despite the flakey, in and out internet here, that I might remain home, enjoying my privacy. After one month it’s the first privacy I’ve experienced on this trip. A highlight yesterday was eating shuwarma on my second floor porch in the camp: cool evening, looking out at the neighborhood and the separation/annexation/apartheid wall. Two evenings ago, while sauntering to the market and cash machine and self-guided tour of the Jacir Palace, the exclusive hotel right outside the camp, I observed night football (soccer) on what may be the only football field in the camp. Play was vigorous and hot. I tried photographing with my phone, failed because of the dim light and poor zoom. Why had I forgotten my camera? I’ve also learned about the use of names like grandma, uncle, etc. Such people may not be blood relatives; those names might be honorifics. So when Mousa earlier told me we were to meet his grandma, she was not a blood relative. Very confusing, as usual, one challenge when crossing cultures. I should also write or see Mousa about the man who offered to go with me to his ancestral village. Follow up-follow up-follow up, one of the keys to success. Researching online Rowwad’s sparkling new guest quarters, I discovered a single or double rents for $15, half what I’m paying at Lajee guest quarters. Cleaner, newer, probably everything works better, but wouldn’t I feel lonely there, with apparently so few residents? And how well does everything actually function? Where and what would I eat? An improvement over Rowwad’s old volunteer housing in the camp which I remember was long and dark with a rudimentary kitchen and one interesting housemate, someone who came and went between here and somewhere mysterious and distant. I never learned the details of his story. 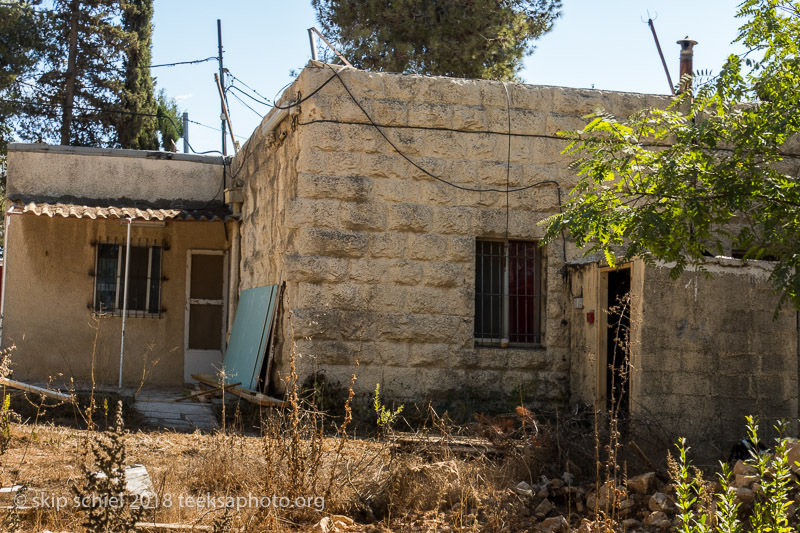 Later I will seek and photograph one original site of Abed’s family, Beit Natiff. What will I find there? Yesterday [September 20, 2018], after the celebratory conclusion of the 5-day basic-advanced Alternatives to Violence Project (AVP), workshop, our team guided by Lubna toured the old city of Hebron. A region of another form of internal displacement: Israelis force Palestinians from their homes; the Israelis then occupy the homes. 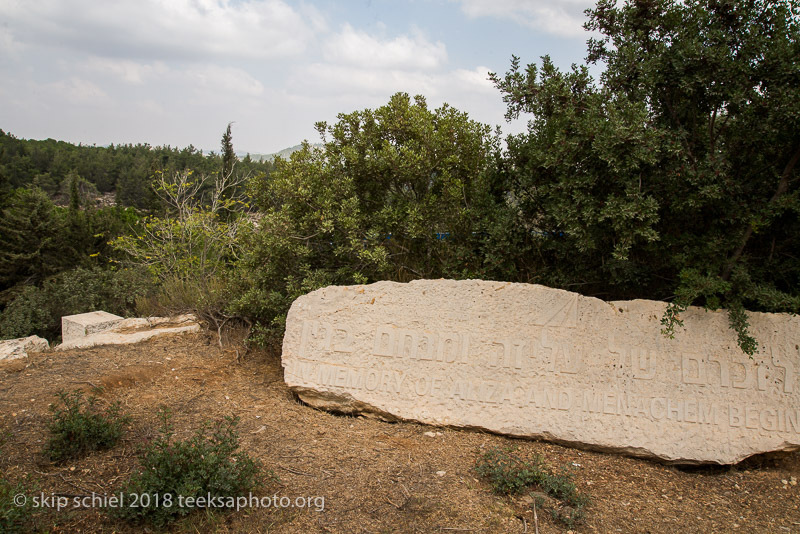 We went down, down, down, and then a little up to reach the Ibrahimi Mosque, the burial site of the region’s first family, Abraham, aka Ibrahim, Sarah, Jacob, Rebecca, and others,—notably I believe, not Ishmael (where is he buried?). The new settlers—even tho Jews were here for millennia—now steal property of Palestinians, which they claim was originally theirs. Walking the narrow path ways past numerous shops, food including expertly crafted piles of zattar; clothing including intimate clothing for females; house wares; men’s pants; shoes piled high with an occasional stitching machine to repair shoes; and other merchandise, we walked beneath wire and fabric overhead, installed to protect against the garbage, urine, and feces hurled down by Israeli settlers who’ve moved into Palestinian homes. The injustice is shockingly visible. 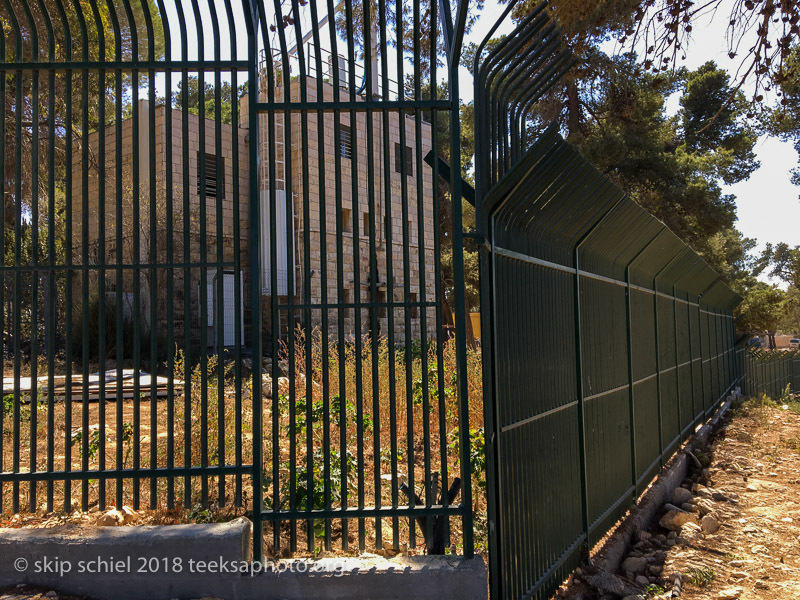 Gated pathways; garbage thrown by Israelis behind fences which entices vermin, snakes, scorpions, etc; Palestinian and Israeli homes directly across from each other; Israeli flags; the periodic raid or forced closure of shops; innumerable checkpoints; and the sealed doors all bespeak impunity. I imagine Rebecca, our Jewish colleague, was even more horrified than us. My Jewish friend, Stan, might have wept. A young stocky dark shopkeeper joined us as an informal guide, offering personal experience to underscore conditions. This is a route most tourists avoid. About the only visitors are groups like ours, such as my first encounter in 2003 with a delegation, a second one with the Magi pilgrimage, and a third I seem to recall on my own to visit the Christian Peacemakers Team (CPT)in Hebron and Atwani, the Palestinian village in the Southern Hebron Hills. Maybe also in conjunction with the Ecumenical Accompaniment Programme in Palestine and Israel . My last visit to Hebron may have been about 10 years ago. On this walk I renewed memories and updated insights. In the mosque, now “shared” since the Six Day War in 1967, 60% synagogue and the rest mosque, we learned about Baruch Goldstein, a Jewish medical doctor who’d moved to Israel and enacted his extreme Jewish religious and nationalistic views. Here in 1994, Baruch Goldstein perpetrated a massacre of worshipping Palestinian Muslims. A worker guided us to bullet holes surrounding the Imam’s sitting place. Goldstein entered thru that door, the guide told us, vividly, walked to this spot and with his automatic weapon killed 29 people, injured nearly 200, before his gun jammed (or he had problems loading a new clip), and he was beaten to death with a fire extinguisher. All in a place of worship. Did this incident register for me nearly 30 years ago? Did it implant a seed that now grows thru my present work? Did it bring me to this special place once again (because I’d been to the mosque several times before) with these special people? We were long on our feet: Rebecca may have felt it the most. As others discussed history, I sat on the floor to rest against one of the monuments before retracing our route. I’d considered asking if we could walk out thru the Jewish section but this would possibly imperil Lubna who wears a hijab. On the way in we noticed the work of the Hebron Rehabilitation Committee, HRC, most notably the restoration of a sesame seed press. The manager—he rented from another family who’d owned it for centuries—explained to me that only about 3 groups per week visit, many more during Ramadan because of how the mosque draws, many fewer during the winter, but few buy. I suggested that for me at least, in the region for another month, buying means carrying. So I declined his offers, as did my entire group. Because the income from his shop is not sufficient, he works in a factory. A small achievement: after I’d asked Lubna where I might purchase an exfoliating scrubber, she found something for me. She explained that local women weave a certain plant into body scrubbers, similar in function to luffa sponges. After purchasing some in Palestine and using them for years at home, I’d searched for similar devices in the Boston area where I live, and on-line; I failed to find anything other than inferior plastic surrogates. I was not sure that what Lubna found for me was precisely what I’d searched for, but I bought 2. Ten shekels or about $3 each. To last perhaps until I expire. Watching as we strolled thru the souk, this was the only shop I spotted that carried this particular item. We stopped in a garden for respite, some drank coffee and some fresh-squeezed carrot juice (I discovered later they feed the carrot scraps to their chickens—some well-fed chickens), reviewed the walk and the AVP workshop, found a bus, and finally made it home. Another long, tiring, fulfilling day on the road. First woman I’ve photographed for this set. Nidal Al Azraq’s mother, 9 years old when she fled during the Nakba in 1948. Remind Nidal to send medicines with next person coming (which could be me). Since expulsion she has never visited. Fled first to Bethlehem, then to Aida camp. Feels her health deteriorated from sadness over loss. 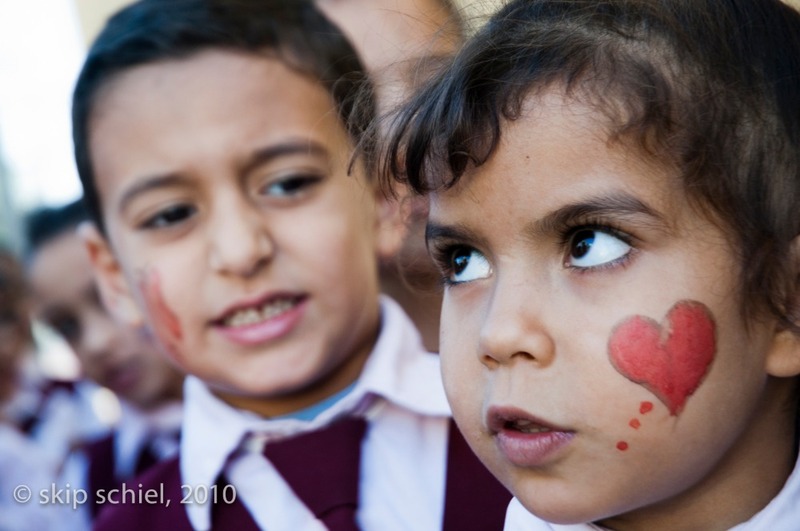 Wants to see my photos, either prints or files, ask Nidal and Mousa (my assistant and translator) how to do this. Wants me to cut a sliver of a fig tree in her village and bring it to her to plant. I’d asked her if there were something of hers she’d like me to deposit in the village. Answered no. I told her she is beautiful, her mouth especially. While photographing in the house I spotted a woman in bed with an electronic device who quickly turned away from me. Five of her children born in one room, others in other places in the house. In a photograph on the wall one of her sons, 21 years (?) in prison; she stands with him (also in another photo with his father). I feel project has finally, fitfully begun; I’ve met actual people and heard their stories. Whether to video or photograph? How to use narration, get it translated? Not particularly pleased with my first photos. I might return to photograph full frontal view, she looking directly into camera, as an opener and closer of this and all sessions.